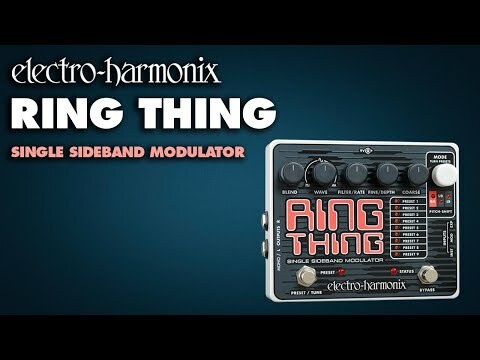 Electro Harmonix Ring Thing Modulation Guitar Effects Pedal The Electro Harmonix Ring Thing presents state of the art modulation control all.. The Electro Harmonix Ring Thing presents state of the art modulation control allowing the user to explore a new sonic world that is both familiar and inventive. The Electro Harmonix Ring Thing features complex modulations with interactive parameters that can create any sound your mind can imagine. From metallic sweeps to subtle color changes to unique and limitless modulations, the Ring Thing will become your sonic dream machine. Articulate pitch shifting, preset tuning, selectable waveforms and external control delivers sound designer mystery, with a Rock and Roll edge. The Electro Harmonix Ring Thing Main has you covered from all angles when it comes to modulation effects, whether it's pitch-bending, tremolo, whammy, and more that you want to use!